In all of prophetic Scripture, there is one overwhelming theme: God does not take sin lightly. As a result of that attribute of Gods Divine Justice, we have been witness through our study of the Book of Revelation of the wrath of Almighty God poured out on the inhabitants of Planet Earth. This wrath is particularly evident in the second half of the Tribulation period and will culminate with the Battle of Armageddon as Jesus Christ will return to rule and reign for 1000 years. In Disc 5 of our study, we are drawing very near to the finale of Gods wrath. Chapters 15 and 16 describe the 7 vials of Gods wrath that will be suffered by those who have received the Mark of the Beast, and we will discuss how Lucifer counters the wrath of God with evil spirits that seem to turn everything around for sinful mankind. However, these evil spirits will only set up Antichrist and his followers for the events that will push him to the point of gathering his armies from all over the world for the final showdown at Armageddon. 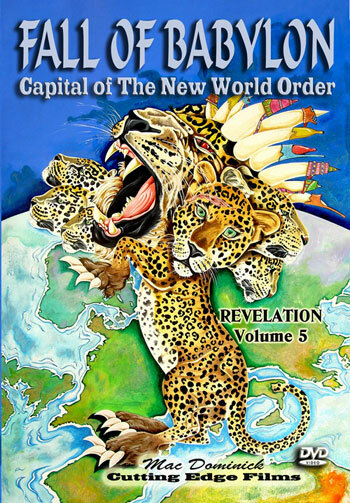 This major blow comes in 2 phasesThe destruction of the one world religion in Revelation 17 and the fall of the Antichrists capital of the world in Revelation 18. The destruction of the one world religion will come from an internal conspiracy by Antichrists rulers of the 10 world regions who will burn the religious center of the world, Mystery Babylon, to the ground. This is recorded in Chapter 17. The fall of the political capital, Babylon the Great, will be the result of a major rebellion that will descend upon Babylon from the north and wipe the city off the face of the earth. We will see how see this detailed in Chapter 18, the book of Isaiah, and the book of Jeremiah. Thus as we near the final battle and the reign of Jesus Christ as King of Kings and Lord of Lords, our study will give us the details of how these events will transpire and lead Antichrist and his vast army to the plains of Megiddo and the Battle of Armageddon.